This year, adidas Originals welcomes you to celebrate Originality in the neighborhood. Get invited to play on the street where Originality lives at the adidas Originals Street Party event at the Venice Piazza Mall Open Park, Mckinley Hill, Fort Bonifacio, Taguig City. Get a free carabiner keychain when you snap a picture of the Originals Trefoil logo and experience Augmented Reality in our stores. 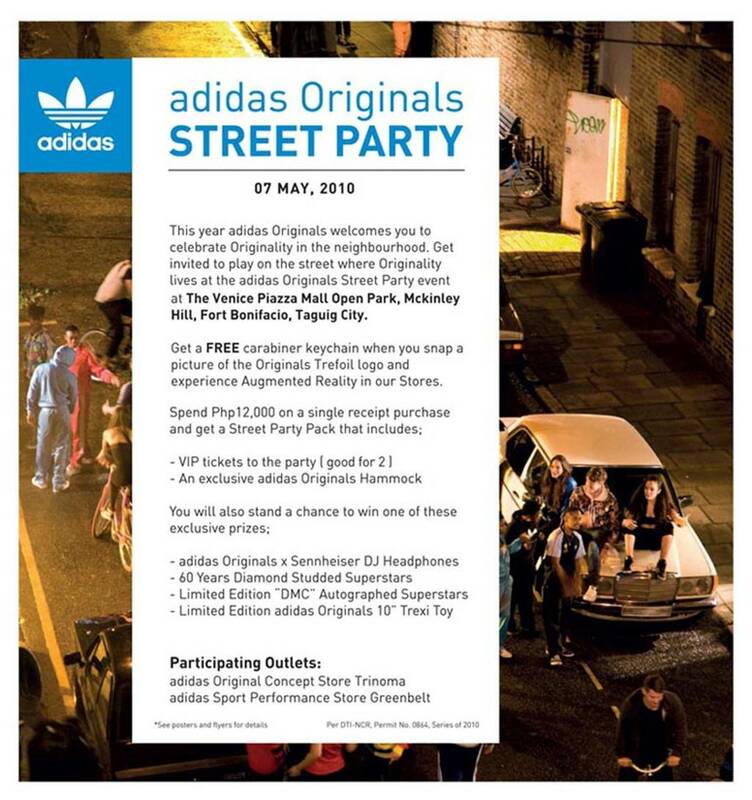 For every single receipt purchase of PhP 8,000 customer will only receive 2 Street Party invites on May 7, 2010. Any single receipt purchase is equivalent to one (1) Raffle Coupon. Customer must fill up all contact details and should drop in participating promo boxes. Customer should attach proof of purchase in the raffle coupon. Employees of adidas Philippines and participating outlets including their relatives up to the second degree of consanguinity of affinity are disqualified from joining the promo. Customers can only win once. Promo period is from March 31 – May 5, 2010. Raffle will be done on May 7, 2010 at the adidas Originals Street Party Event. Winners will be notified through registered mail. Redemption of Prizes shall be 60 days from receipt of notification otherwise it will be forfeited in favor of adidas Philippines with DTI approval. Winners can claim heir prizes at 38th Floor Robinson’s Equitable Tower Ortigas Center, Pasig City. Winners must present 1 valid ID, and claim stub. Deadline of entries is on May 5, 2010.